What sort of a retro blogger would I be if I didn't wish Pac-Man a happy 30th Anniversary? To celebrate, here's seven cool trivia tidbits I've learned this week about the only video game that truly captured my heart. It is also one of the few things I have in common with my baseball-loving, seafood-eating, beer-brewing hubby. We realized this when it came time to pick a cool wedding cake topper. I found out he wasn't a fan of Smurfs and wasn't really down with Dear Daniel and Hello Kitty (the famous Sanrio couple) -- my first cake topper ideas. 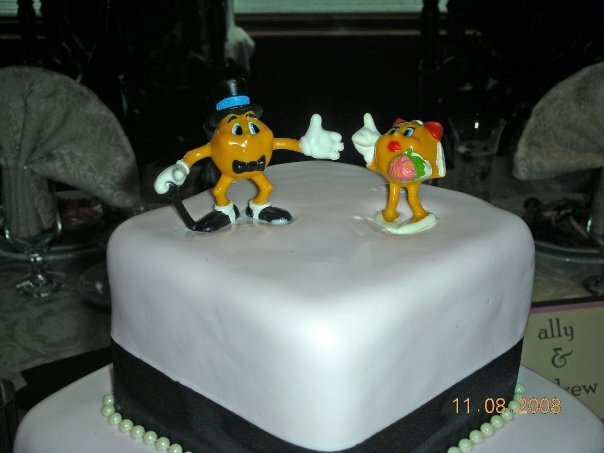 We went with Pac-Man and Ms. Pac-Man bride and groom figurines purchased on eBay for $50 a few months before the wedding. 1. 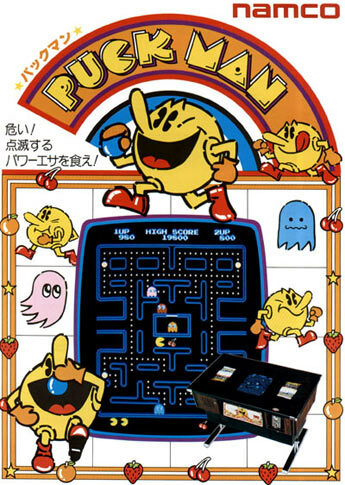 Original name for Pac-Man was Puck Man, but fearing Americans would switch-up the "P" with an "F", Namco decided to change the name. 2. 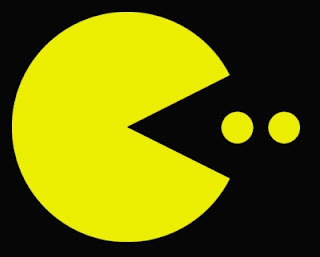 Pac-Man's simplistic shape was based upon a pizza pie missing one slice of pizza. 3. The game was developed with women and couples in mind. Most of the original video games at that time were male-oriented which focused on shooting, space, aliens, etc. 4. Designers felt that using food-munching as one of the game's objectives would attract female game players. 5. An estimated 10 billion+ games of Pac-Man have been played worldwide. 6. "Pac-Man Fever" by Buckner & Garcia reached #9 on the Billboard charts and sold 2.5 million copies. Their record label was so impressed with Jerry Buckner & Gary Garcia's fun lyrics, they commissioned the Akron, Ohio duo to create an entire album consisting of video game songs. 7. Ninety-four percent of Americans can identify the Pac-Man image, talk about amazing branding. It's funny, the sound effects and music associated with the Pac-Man game, instantaly bring me back to age 10 playing against my dad in arcades on Long Island. Happy 30th my little yellow friend. Happy 30th! I loved Pac Man. In fact, there was a Pac Man machine where I always got frozen yogurt as a kid. Now, whenever I get vanilla soft serve with M&M's I also think of that round little guy. LOL, Puck Man would have been very unwise! Wow 30...I remember my 2 sisters having a Pac Man war, they would race each other home to try and beat the other to play it...an they would never let me play!!! One of the very few games I could play! Wonder who was the genius that came up with Puck Man??? Love your cake toppers! Puck man would've made for great limericks. CONGRATS on breaking 400! You're amazing! Until recently I had Pac Man on my phone and played it all the time. Happy 30th Pac Man!! That's pretty cool that it was originally geared toward women...probably why I was the Pac Man QUEEN back in the day! LOL I spent HOURS of fun (and quarters) at the local mart playing this with friends. I LOVE your cake toppers! How original! Wow - I didn't know Pac Man was 30 already. Now I feel old. Boo. Hiss. Bahaha, puck man! If I had been in middle school, we would have had a field day with that name! I knew about number 1, and I actually did a post about #6. haha. Good stuff. BTW...love the google game. Played it twice. i still love pac man. its great when you're bored! Pac-man survives the test of time! When I teach my first graders greater than and less than, I always use Pac-Man as an example, and they always know exactly what I am talking about. i have loved your cake topper since the first time i saw it. I actually thought of you when I realized it was the anniversary of the game b/c of it. I love Pac Man. I was so excited when I saw the Google logo was playable. 30 years! Wow. Almost as old as me! 400 followers! Wow! I'm happy to say that I knew you back when you had a paltry 100 or so. All I have to do is read the name pac-man and I hear the sound of the game. Being a video game fan I do love some Pac Man. You can't deny the classics their place in history. Those facts are incredible. Especially the Puck Man one and the one about being based on a missing slice of Pizza. He'll always be Pac to me!! Sheesh, he's almost as old as me! I loved playing it on Google the other day haha. I wish a good rom for Super Pac-Man would be released. I'd play whatever for it. Pac Man was my game. To this day, it is such an addictive thing for me. I think it rocks the house that those were your cake toppers. I would love a Pac Man machine in my house. Oh I always loved Ms. Packman. I was never very good at it, but I still even now at 60 would like one of those games. Somehow it facinated me. I enjoyed your blog, thank you for letting me visit. My son and I have been playing the google pacman game nonstop! Have you seen the individual Pac Man games you just plug right into your TV? We have them. My kids play it all the time... so funny to me. I Saw E.T. 14 Times - IN THE THEATER! Celebrating 400 Followers With A Video Blog! Remember Heather O'Rourke From Poltergeist?